Mammut Mountain Shirt. The mountains are waiting for you: the Mountain Shirt Men will turn you into a summiteer on your next hike. 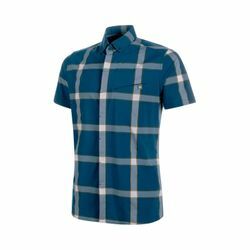 The shirt is made from a lightweight and comfortable material with elastic properties which make it feel very comfortable to wear. An antimicrobial treatment reduces unpleasant odors, while the shirt impresses with active moisture-wicking. Up in the mountains, get set, go!